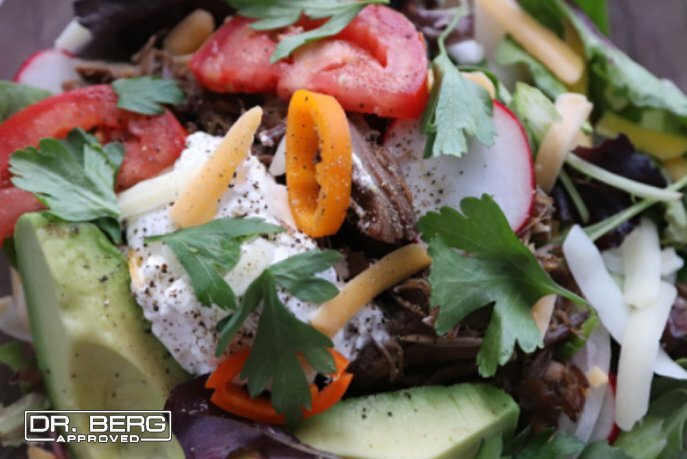 DR. BERG'S KETO FRIENDLY RECIPES - Eat well, feel well and still be able to burn fat! These keto-friendly cinnamon buns are only 5 g net carbs. 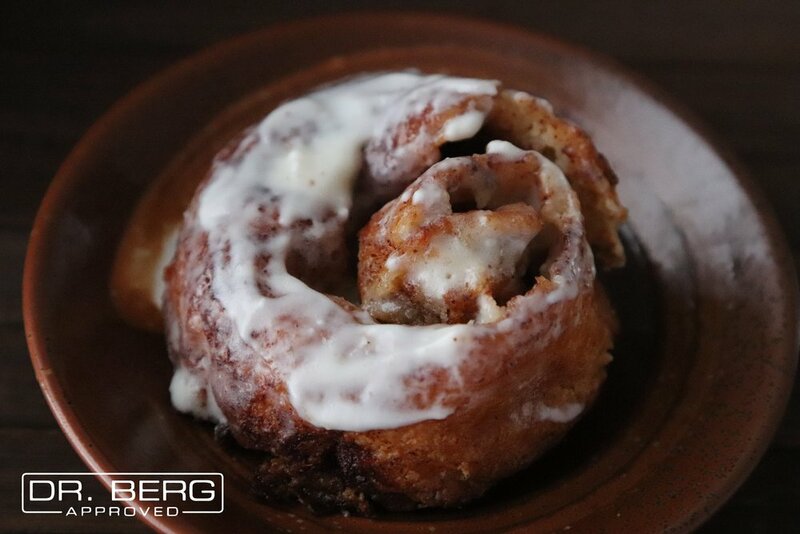 Guilt-free cinnamon buns seem too good to be true, but they aren't when you do keto! 2. In a medium bowl, combine mozzarella and cream cheese. Melt down cheese. Form into a ball of dough. 3. In a separate bowl, mix together almond flour, erythritol, and baking powder. Add egg to mixture. Mix well. 4. Knead almond flour mixture into cheese mixture. This will take a while. If the dough feels too sticky, feel free to add some more almond flour. 5. Lay the dough out on parchment paper. Cover with an additional piece of parchment paper. Use a rolling pin to roll out the dough. You want the dough about 1/2 inch thick. You want the dough to be in a somewhat rectangular shape for when you roll the dough. 6. Coat the dough in melted butter, cinnamon, and any granulated sweetener. 7. Roll the dough into a little cinnamon roll log. 8. Gently cut the roll into 4 equal parts. Bake in the oven for 20-25 minutes. Cover with frosting. Bake for 1-2 mins. In a food processor, blender, or with an electric mixer, mix cream until whipped. Mix in cream cheese. Add sweetener to taste, either liquid stevia or powdered Erythritol or Xylitol. For a piping bag, place the mixture into a sandwich bag. Let out air and seal bag. Cut off tiny corner. A keto-friendly cheesecake! Top with some berries, if your macros allow it. Cream Cheese - 4 oz. Melt butter. Add almond flour. Mix together until crumbly. Divide mixture into 3 parts and place into a mold and press down, so that it is packed tightly. Bake in oven for 10 mins until crispy. Mix together cream cheese, egg, xylitol, and a pinch of lemon juice. Pour into molds with crusts still at the bottom. Bake at 350 degrees for 15-20 mins or until done (if you poke it with a fork and nothing sticks to the fork, then it is done). Place in refrigerator overnight to set. Or if in a hurry, place in freezer. If your macros allow, cut up some strawberries, place them in a saucepot and cook with a little bit of keto-friendly sweetener for a sweet low-carb fruit topping. This is a delicious easy keto-friendly shortbread. For an extra treat, melt some keto-friendly dark chocolate and dip ½ of the cookie in it. In a medium bowl, mix almond flour, salt, and sugar. Add chunks of butter and mix well. Use your hands to mix and pinch the butter until well blended. Add vanilla. Knead into a ball. Pinch off chunks and roll into balls about 1 inch diameter and place on a parchment or silicone mat lined pan. Press the balls slightly with the palm of your hand or a fork so they are ½ - ¼ inch thick. Bake 350 degrees for 8-10 minutes. Be sure to pull them out before they brown. This recipe does not make a lot of cookies, so you may want to double or triple it! Enjoy! Melt some keto-friendly dark chocolate and dip half the cookie in it for an extra treat! Eat only one of these at the end of your meal to help satisfy your sweet tooth. 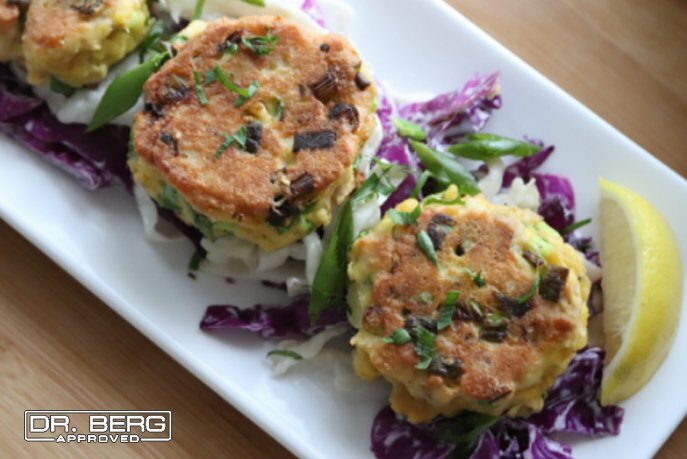 Try these delicious low carb pancakes. Regular pancakes have about 20g carbs per pancake, this keto pancake has only 6g carbs per pancake. Serve with softened butter. Make your own keto-friendly syrup with VitaFiber and Maple Extract! Gently mix wet ingredients into the dry ingredients. Set pan or griddle to medium heat (350 degrees). Make into 6 medium pancakes. Smaller pancakes are easier to flip.